With tourism being Mexico’s third major industry, the country’s government has developed several programs to support this important, dollar-generating sector. One of them, called Pueblos Magicos (Magical Towns), aims to increase tourism to towns that are of particular historic or religious value, or that are located near large cities or other tourist sites. As of October 23, 2006, the town of Todos Santos (about an hour drive from Cabo San Lucas or La Paz) is joining the 23 “Magical Towns” already in the program. Founded in 2001 by the Tourism Secretariat (Sectur), the Pueblos Magicos program coordinates local, state, and federal efforts, channeling funds for diversification and improvement of the towns’ tourism infrastructure. The idea behind this Sectur’s project is to show that Mexico is much more than just sun and beach. Converting quaint, culturally rich towns into visitor-friendly destinations, the government wants to make sure they retain their authentic Mexican charm, which is ultimately what sets them apart from other destinations. Developing cultural tourism is the program’s primary focus, but eco-tourism, adventure tourism, and rural tourism are also taken into consideration for development projects. 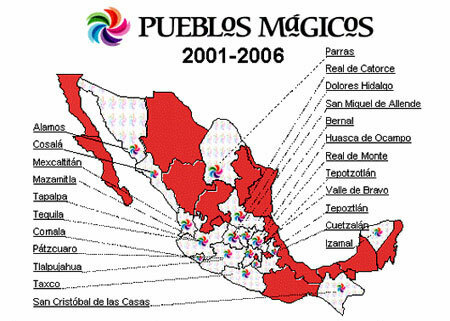 It’s not easy to become a Pueblo Magico, but once a town is chosen to participate in the program, it receives multi-level support, including funds for modernization of tourism-related businesses such as handicraft shops and restaurants, as well as for development and production of promotional materials for advertising. Improvements to the roads and highways around Pueblos Magicos and the assurance that the hotels and other establishments within the towns provide the highest level of service are also on the task list. One of the program’s most important challenges is to maintain the town’s historical accuracy throughout the modernization process, and because of that all participating towns must comply with architectural and visual guidelines. Thanks to the government’s investment, coordinated by Sectur, the Mexico Ministry of Tourism, http://www.sectur.gob.mx/, 23 Mexican towns already have the status of Pueblos Magicos and are already benefiting from the program’s efforts to boost tourism and restore the original, cultural beauty.